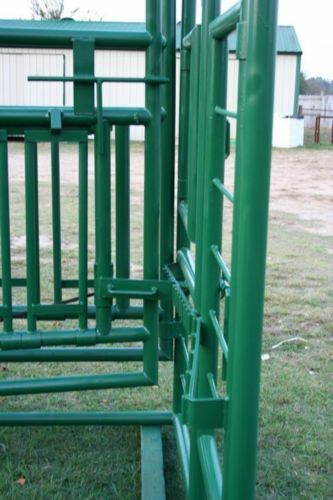 This is a squeeze chute made for Longhorns. Side entrance and exits so the horns slide in easy. Palpation gates front and back for working either end. The framework is made from 2 3/8" Heavy Wall Pipe (.190 wall) and the gates made from 2 3/8" Sch 30 & 14 ga. Pipe making this the toughest longhorn working chute on the market. 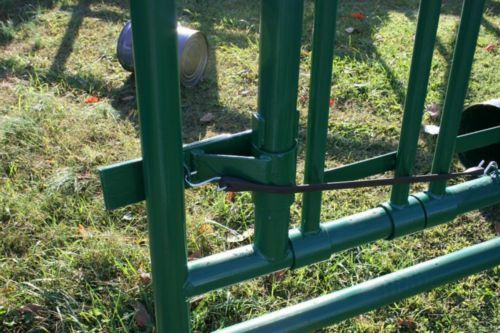 The pictures with Livestock are from the original latch design. We have improved it to the new Latch design shown in the other photos. I purchased this chute in June, 2014. The chute is great, but it took awhile to develop a system of gates to get the cows into the chute. 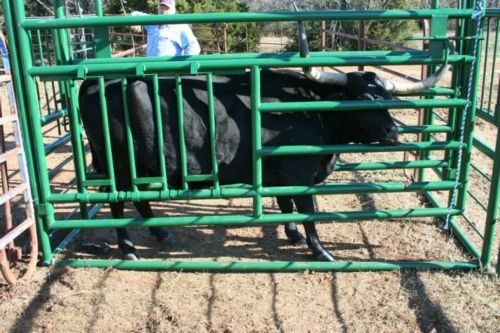 This is the best chute available for Texas Long horn cattle. Now I even prefer to use it for my Black Angus 90% of the time. I operate my system alone and this chute is better than a traditional alley and headcatch type squeezechute for non-horned cattle for simple vaccinations and AI work. We have a few chutes and neither of them are P&C. But you can bet the next time we get one it'll be. I've referred all my customers to them. They make the best system out there. My wife and I started breeding and raising longhorns cattle a little over 2 years ago and prior to that had no experience with livestock. Our herd has quickly grown to right at 30 head. As I am sure everyone else has experience it is a never ending investment and something work well others not so much. 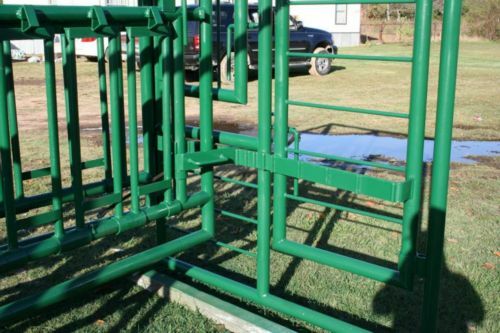 By far our best invest in equipment has been our Longhorn Cage and hay ring (square LOL). Working these longhorns can be a bit sketchy on a good day but with them secured in this device I have the confidence to do what I need to without worry of my or the animals safety. 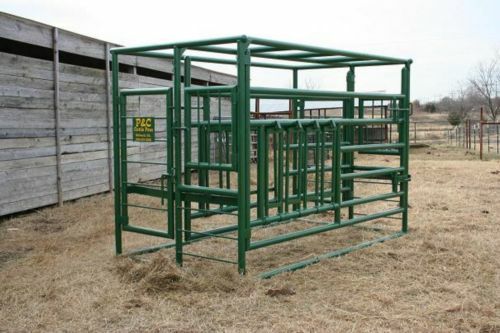 This is well built and a great value I would advise all to consider this when planning your chute purchase. I met Paul and looked at his new chute at the TLBAA Horn Showcase. I was impressed how the chute was built and the quality that he puts into his product. I have used other chutes on the market and this one hands down is the best! I usually work cattle with a few of my guys. With this chute, I can work cows alone. 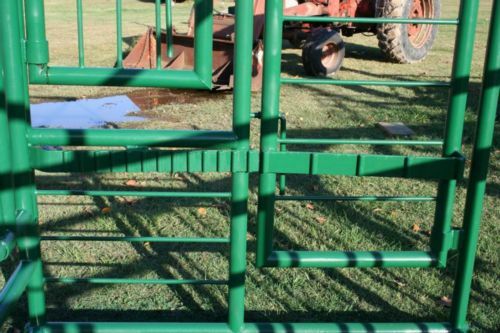 What a great product and I recommend this chute to anyone that own cattle! We met Paul and his Longhorn Chute at a Longhorn Cattle show in Ft Worth, Texas. After he showed us how it operated we were sold. Now after much use, my wife and I are able to work the cattle with just the two of us, so much safer and efficient than before. 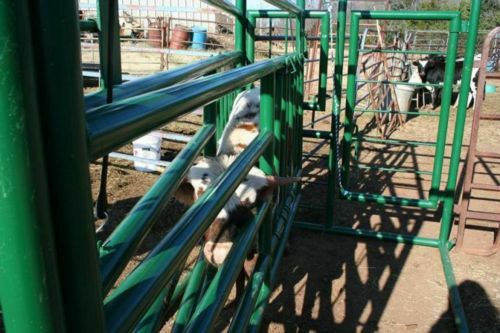 The chute works great for calves as well. We are able to give all the cattle shots, tags, branding, and banding with ease. It also keeps the horns safely positioned and free from damage. Believe it or not, I now look forward to working the cattle and it has become fun. Thanks Paul! This chute has completely changed how we work our longhorns! We can do more work, more efficiently, on more cows and be completely safe while doing it. This chute also offers the flexibility to work solo if I need to. Thanks so much for such a great product! After skating by with makeshift squeeze chutes we decided to get serious with our equipment, we did a lot of research and made phone calls to various chute manufacturers, we talked to Paul and really liked the way he operated so we decided to order the Longhorn Chute. Let me tell you, this thing is an absolute game changer! 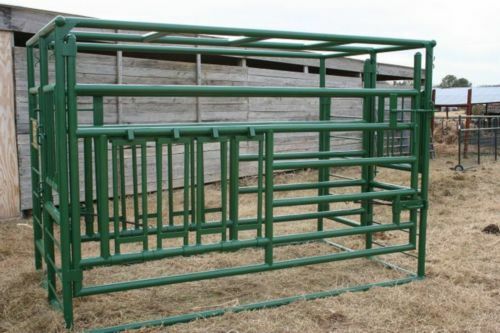 It is so simple to use, so sturdy and so well built that it makes working large horned cattle an absolute breeze. This is a must buy for any size operation, it saves time, effort and stress and virtually eliminates the risk of injury to person or livestock. A sincere thank you to Paul for such a fantastic product! 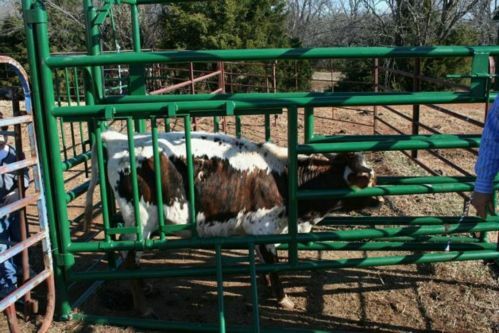 I purchased the longhorn cage after looking at other setups for working longhorn cattle. The very first time my wife & I used it, we marched each of our 10 animal herd into it calmly, safely, & in a short amount of time. All cattle were wormed & measured easily. 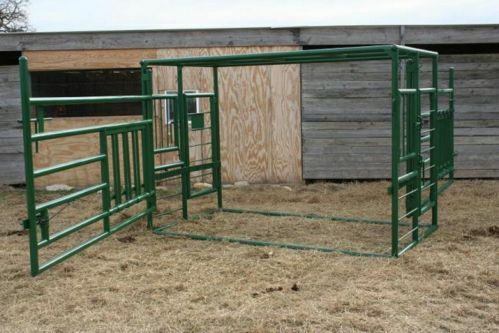 This unit is extremely sturdy and will accomodate longhorned critters of any size. We are excited about the prospect of doing any and all work to our longhorns on sight, including AI. As a small family owned ranch, we have to closely watch how we spend our money, but this is the best investment we've made in years, adding personal safety, working efficiency, and reducing stress to our longhorns in a single step.